Danny Boyle’s opening ceremony was broadly well received in Britain and abroad, if perhaps a little puzzling to those without strong ties to the UK or British culture. There was certainly a political element to it, with the very public championing of movements like the Suffragettes and Jarrow Marchers, and a tribute to the NHS. 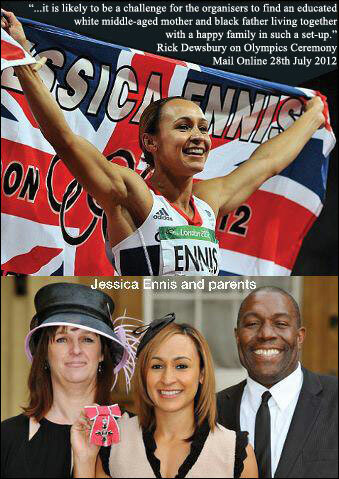 Later in the Games, after Jessica Ennis had taken the gold medal in the Heptathlon, an image circulated on the internet, contrasting Dewsbury’s assertion with the family background of Ennis. The delayed showing of the opening ceremony still generated 5 million social media mentions when it was played in the US, making it, according to one source, the third biggest entertainment event in social media history. Although, presumably, if you counted the mentions during the actual live event, that figure would be a lot larger. Figures showed that despite the complaints of the vocal minority, NBC’s approach was reaping commercial rewards. The Financial Times reported that the company “should break even on its coverage of the London Olympics, thanks to better than expected viewership and ad sales” after predicting a $200m revenue shortfall. This would be a significant financial improvement on the economics of broadcasting the previous couple of Olympic Games in the US. NBC also attracted criticism for a decision not to broadcast the opening ceremony’s inclusion of a tribute to victims of the 7/7 bombings in London and other loved ones who could not be there. Instead, NBC showed an interview with Olympian Michael Phelps, conducted by American Idol’s Ryan Seacrest. One could only imagine the furore if the BBC had decided to opt out of a tribute to 9/11 victims that was part of any US hosted Olympic ceremony. The curious incident of the silenced British journalist, Guy Adams, also involved the broadcaster. LA correspondent for The Independent, Adams had his Twitter account suspended, apparently for criticising NBC’s coverage of the Games. The tweet that seemed to have got Adams into hot water posted an email address of an NBC executive, urging people to complain to him about Olympic coverage. In response, Mr Adams wrote: ‘I didn’t publish a private email address, just a corporate one, which is widely available to anyone with access to Google and is identical to one that all of the tens of thousands of NBC Universal employees share. It’s no more ‘private’ than the address I’m emailing you from right now. Brid-Aine Parnell reported for IT website The Register that ultimately telecoms network O2 were to blame - the GPS units on the bikes were unable to get a signal out to organisers, because the data network was saturated by spectators using their smartphones. Presumably mostly using them to try and find out what the elusive timings were. In the next part of my “missing chapter”, I’ll be looking at protests and disruption at the 2012 London Olympic Games. Download the entire bonus chapter for iBooks | Kindle | PDF. “Keeping the Torch Burning: Terror, Protest and the Games” is an alternative history of the Olympic Games, one that focuses on the social and political events that have defined each competition. Nationalism, separatism, feminism, racial equality and human rights ring loud in this Guardian Short, written by Martin Belam and uniquely told through first-hand reporting from the Guardian and Observer. By Martin Belam on 13 August 2012.